Posterior tibial tendonitis is a common cause of foot pain and dysfunction. If you get pain or swelling on the inner side of your ankle, are finding it difficult to stand on tiptoes or have noticed your foot arch starting to drop, chances are posterior tibial tendonitis is to blame. The posterior tibial tendon is the main stabiliser of the lower leg and plays a crucial role in supporting the main foot arch and preventing the foot from rolling over. When caught early, posterior tibial tendonitis is fairly easy to treat. But, without proper diagnosis and treatment, it gradually progresses through four different stages, which can result in permanent foot deformity. It is also known as Tibialis Posterior Tendon Dysfunction, Tibialis Posterior Insufficiency or Acquired Adult Flat Foot (AAFF) and is one of the most common causes of foot arch pain. The posterior tibial tendon is extremely important as it supports and controls the medial foot arch. 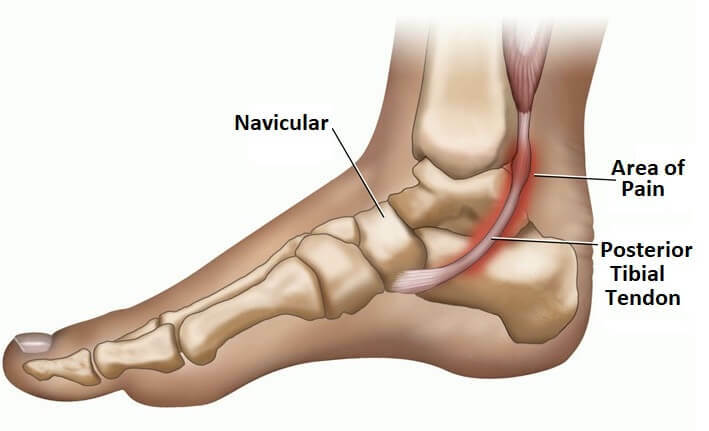 It connects the posterior tibial muscle, aka tibialis posterior, found on the back of the shin underneath the calf muscles, to the inner side of the foot on the navicular bone. Posterior tibial tendonitis is where there is inflammation, degeneration or tearing in the tibialis posterior tendon. The tibialis posterior tendon passes close to the Achilles tendon in the lower calf and then hooks round underneath the prominent inner ankle bone, the medial malleolus. This area, at the bottom of the shin bone, is the most common place for problems to develop in the tendon as the blood supply here is poor. 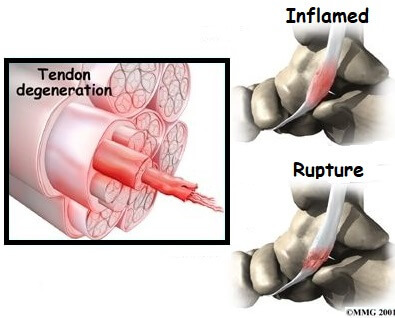 This means the tendon doesn’t receive the oxygen and nutrients required to keep it healthy or to repair from any damage. 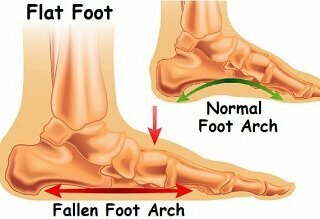 Once the tendon is damaged or inflamed, the medial foot arch will gradually collapse resulting in a flat foot. Pain & Swelling: Pain and inflammation from posterior tibial tendonitis commonly causes foot arch pain that tends to be felt around and behind the inner ankle region and down the side of the foot into the in-step. If the nearby nerve is affected you may also get a burning, stabbing or shooting nerve pain and tingling into the foot. Unable To Stand On Tiptoes: The most classic sign of posterior tibial tendonitis is difficulty standing up on your tiptoes. It may be painful as you push-up onto your tiptoes (known as a heel raise) or you may be completely unable to rise-up at all. Reduced Mobility: People suffering from posterior tibial tendon dysfunction are often limited in how far they can walk. There is typically an achy pain on the inner side of the foot and ankle as soon as you start walking which gets progressively worse the longer you are on your feet, making long distances impossible. Standing for long periods is often increasingly painful and running may be impossible. Flat Foot Deformity: A gradual loss in height of the medial foot arch is common with tibialis posterior tendinopathy. As the tendon weakens it is unable to support the foot and the foot flattens completely which alters the position of the foot bones. Stiffness: Ankle movement is often limited, particularly lifting the foot upwards (dorsiflexion). This is usually due to tightness in the calf muscles. Prolonged stretching, inflammation and subsequent degeneration of the tibialis posterior tendon not only weakens the tendon but puts it at risk of tearing. Stage 4: Complete rupture of the tendon. Permanent deformity of the foot and adjacent ankle joint. Posterior Tibialis Tendonitis is much easier to treat in the early stages. Once it has progressed to or beyond stage 2, surgery is often required. Compression: Wearing a tubigrip compression bandage helps to reduce swelling and support the ankle. It should be worn double thickness from the mid-foot to just below the knee, during the day only. Orthotics: There are a whole range of orthotics that can be helpful with posterior tibial tendonitis. 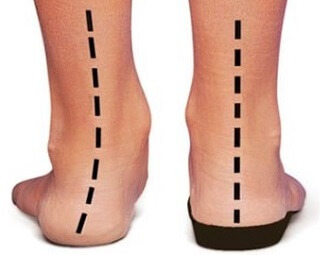 Shoe inserts help to correct foot position by supporting the medial arch and heel. Steroid Injection: Corticosteroid injections are sometimes used to reduce pain and inflammation in tendons, but they are rarely advisable with posterior tibialis tendinopathy as there is a high risk of the tendon rupturing. All of these treatments are most effective during the first stage of posterior tibial tendonitis. If non-surgical treatment for your posterior tibial tendonitis has failed, meaning there has been no benefit over 6 months, and you are stage 2 or higher, then you are likely to need surgery. In some cases, ankle immobilisation may be sufficient during stage 2, but this is rare. Surgery for posterior tibial tendonitis aims to reduce pain, improve function and reduce progression of posterior tibial tendon dysfunction. 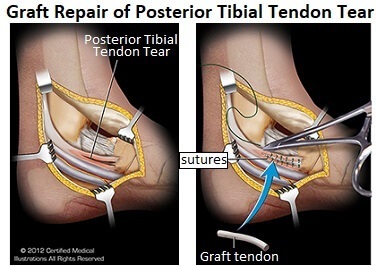 Tendon Transfer: This is where the damaged portion of the tibialis posterior tendon is removed and replaced with one of the other foot or ankle tendons. People can typically walk normally after the tendon transfer procedure, but they may have difficulty running and may not be able to resume certain sports. Fusion: Sometimes an osteotomy is sufficient to correct the foot position, in which case the bones in the back of foot are fused. The cartilage between the foot bones is removed and the bones are held together with plates and/or screws. Over time, the individual bones gradually fuse together to become one bone. The foot will still be able to move up and down but sideways movement is lost. Patients who require surgery, particularly osteotomies or fusions general have very limited ankle and foot movement, moderate to severe pain, and are very limited in how far they can walk prior to surgery. While surgery may seem extreme, people typically find they have much less pain and can actually walk better after surgery. You are usually discharged home a day or two after surgery. If you have had a tendon transfer or osteotomy, you will most likely have a plaster cast to hold your foot in the correct position (slightly turned inwards) to allow the foot to heal. A physiotherapist will teach you how to walk, get up and down stairs and in and out of a car using a frame or crutches. Typically, you are not allowed to put any weight through the operated foot for a number of weeks. 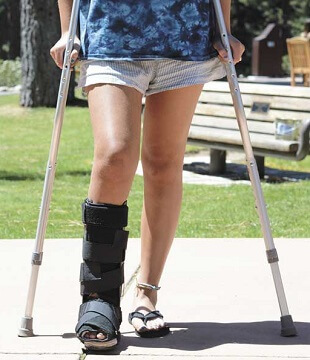 If you have a cast, it is usually replaced every 2 weeks gradually bringing the foot to a neutral position at which point you can start taking your weight through the foot again – this often takes 6 weeks. You may need to continue using a cast for a number of weeks, after which time, you will be given a removable boot to wear. Most people are walking normally within 3 months of their operation. Low-impact sports can be resumed after 6 months but it may take a year before you can return to all activities. You will have regular physiotherapy to improve your strength and flexibility and you may need to wear orthotics in your shoes to ensure a good foot position. Most people make a good recovery after surgery for posterior tibial tendon dysfunction and are walking normally within 3 months of their operation. You can usually return to work after around 4 weeks, but it may be longer if you have a manual job. Low-impact sports can be resumed after 6 months but it may take a year before you can return to all activities. Exercises are a key part of the recovery process, whatever stage of posterior tibial tendonitis you have. Strengthening exercises for the foot and ankle muscles and calf stretches all help to reduce the tension and force through the tendon. There are a number of other conditions that cause pain in the same area as posterior tibial tendonitis. If this isn't sounding quite like your problem, visit the foot arch pain diagnosis section. "Thank you so much! Your website is a fountain of information!" "Your info took me straight to the problem. Well described and clearly explained." "Thanks for having these exercises available! I performed a few and they have helped tremendously with my foot pain." "Very interesting! All good information. Tried a few stretches, already feels good." "3 days ago I thought I was going to need foot surgery. I NEVER thought that stretching my calf would relieve the excruciating pain at the top of my foot. Thank you!!" The material on this website is intended for educational information purposes only for the general public. It should not delay or substitute medical advice, diagnosis or treatment.